We want to be able to filter our data by specifying a given period of time. For that reason, we implement the custom setFilterMinimumDate() and setFilterMaximumDate() functions as well as the corresponding filterMinimumDate() and filterMaximumDate() functions. 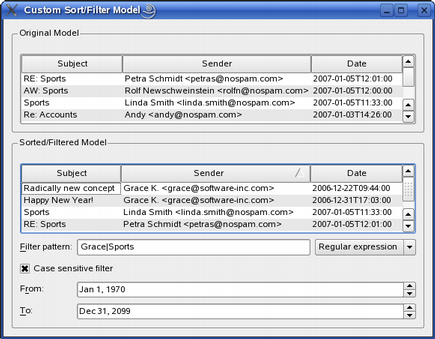 We reimplement QSortFilterProxyModel's filterAcceptsRow() function to only accept rows with valid dates, and QSortFilterProxyModel::lessThan() to be able to sort the senders by their email addresses. Finally, we implement a dateInRange() convenience function that we will use to determine if a date is valid. We use QRegExp to define a pattern for the addresses we are looking for. The QRegExp::indexIn() function attempts to find a match in the given string and returns the position of the first match, or -1 if there was no match. If the given string contains the pattern, we use QRegExp's cap() function to retrieve the actual address. The cap() function returns the text captured by the nth subexpression. The entire match has index 0 and the parenthesized subexpressions have indexes starting from 1 (excluding non-capturing parentheses).